Our detectives need your help identifying two suspects! 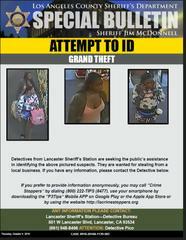 The two women, pictured in our bulletin, are wanted for grand theft from a local business. If you can identify these women or have any information, please contact Detective Pico at (661)948-8466 referencing case # 918-20166-1139-083. Anyone with information about this incident is encouraged to contact the Los Angeles County Sheriff’s Department Lancaster Station at (661) 948-8466. If you prefer to provide information anonymously, you may call "Crime Stoppers" by dialing (800) 222-TIPS (8477), use your smartphone by downloading the “P3 Tips” Mobile APP, “P3 Mobile” for the hearing impaired on Google play or the Apple App Store or by using the website http://lacrimestoppers.org.